Assembling a powerful economic development deal means putting all the right pieces in all the right places. Utilities invented the field of economic development. It was a simple pitch, really: Turn up, plug in and turn on. We'll help keep your business flowing as long as you keep our electrons flowing. Dependable and affordable power still lies at the root of many site selections. The end user might be assembling cryptocurrency instead of Chryslers, but good old power provision can still sway good old high-dollar manufacturing decisions. "Entergy Louisiana's low-cost, reliable power allows our Iberville Parish facilities to compete effectively in the global marketplace," said Yasuhiko Saitoh, president of Shintech Inc., in August on the signing of a new long-term agreement with the utility. It came just after the company announced it would invest in a $1.5-billion, 120-job expansion to develop a new chlor alkali and vinyl chloride monomer production facility and expand its existing polyvinyl chloride plant near Plaquemine, where the project will create up to 3,000 construction jobs. But things today are different. Industries also are seeking sustainability, often via self-generated renewable energy on site or purchased through their utility. And with the onset of smart grids, microgrids, electric vehicle mobility networks and the internet of things, industrial and office occupiers alike are looking for the best ways to move information packets as well as those crucial electrons. That means moving broadband capacity into underserved areas — and that task often falls to the private-sector utility or electric cooperative. PowerSouth President and CEO Gary Smith put it this way in an August column, "Communities without strong information infrastructure are rarely viable candidates for economic growth. Businesses will only locate where they can communicate." As The Wall Street Journal pointed out in August, high-tech companies are landing in places like Huntsville, Alabama, and Clarksville, Tennessee — both in Top Utility TVA's territory — in part because of access to clean and affordable energy, and because of partnerships with TVA's economic development and local power companies. "Reliable power is an especially critical asset for technology giant Google as it delivers data to users around the world without fail," TVA noted in August, highlighting its deal of a couple years ago to provide renewable and steady power to a new Google data center that, as it happened, landed at a closed coal-fired power plant in Alabama. Lest we forget, utilities' own operations do their part too, with the power company contributing to overall community welfare in a multitude of ways from job creation to taxes. In AEP's case, a new data center it will service happens to be in-house: Investing more than $125 million and creating 17 new jobs in the Columbus region in Ohio, AEP will construct a 22,000-sq.-ft., Tier III backup data center in Groveport that will connect to AEP's primary data center in New Albany. Every utility on our list has pitched in to what seem like increasingly frequent hurricane recovery missions. They also are pursuing grid modernization in all its forms. At its most concrete, it involves literally moving power lines, as Entergy Mississippi is doing with a $1.5 million project in Franklin County that's replacing 125 wooden poles with about 160 new ones; using steel poles for highway crossings; and replacing 147 spans of copper wire with 189 spans of stronger aluminum wire, along 10 miles of line. This year's elite group of Top Utilities in Economic Development (presented here in alphabetical order) was determined by examining corporate end-user facility investment project activity in 2017 within the utilities' service territories, and calculating those projects' jobs and capital investment numbers on a cumulative and per-capita basis. Among the highlights of the 7,331 new jobs and more than $12 billion in corporate project investment in AEP territory last year were the Gulf Coast Growth Ventures (ExxonMobil/SABIC JV) ethylene cracker plant in Portland, Texas (600 jobs and $7 billion in capex); Facebook's data center in New Albany, Ohio (150 jobs, $2 billion); and Braidy Industries' aluminum rolling mill in Ashland, Kentucky (550 jobs, $1.3 billion). Appalachian Sky, is a new initiative that began in AEP's Kentucky territory and grew to encompass AEP territories in the Tri-State region (eastern Kentucky, southwestern Ohio, and western West Virginia) to attract the aerospace and aviation industries to AEP's central Appalachia service region, after regional workforce analysis in AEP's Kentucky territory showed coal miners have transferable skills to the aerospace and advanced manufacturing industries. A consultant has been commissioned to certify 19 counties in the region as AeroReady. AEP added 16 new sites to its AEP Quality Sites certification program in 2017, bringing the total to 45 sites in the portfolio, five of which have successfully attracted job-creating investment from companies. AEP, whose territory encompasses 12 million people in 11 states, plans to invest $24 billion through 2021 to rebuild and enhance aging infrastructure, add advanced technologies to the energy system and create a more reliable and resilient grid. Serving 3.9 million customers in over 400 municipalities and all or a portion of 25 counties in the northern third of the State of Illinois, ComEd recently found it directly contributes $1.56 billion in supply chain expenditures and generated an additional $1.34 billion in goods and services, supporting 16,000 jobs (with $1.11 billion in wages), as determined by the REAL Institute. In addition to working with customers, ComEd works to enhance the business climate. Ed Sitar, ComEd's manager of economic development, says the state's new Future Energy Jobs Act "pivots Illinois to the new clean energy economy, saving and creating thousands of clean energy jobs and providing job training for the future workforce, while also creating significant consumer and environmental benefits. The law significantly expands energy efficiency program funding and offers incentives for solar energy installation." Meanwhile, the utility's own Energy Foundry, created specifically to invest venture capital in today's most promising energy start-ups, has invested in 13 companies, representing 150 new jobs to build on alternative energy options for customers. ComEd spearheaded the launch of a new proactive statewide business outreach and retention initiative known as CORE (Creating Opportunities for Retention and Expansion), and also continues to pursue its Energy Ready Zones program (created to match areas with available substation electricity capacity and large vacant land sites primed for development) and its economic development "boot camps" for community leaders. This squad helped cultivate $5.9 billion in corporate facility investment that brings with it more than 12,460 jobs across a 95,000-sq.-mile territory in parts of seven states that is home to 9.2 million people. "Some of our key highlights for the year include expansion of our electrification program (i.e. electric vehicle charging infrastructure), launching a new and improved economic development rider program, adopting drone technology [to modernize site viewing capabilities] and growing our team," primarily in Florida, says Stuart Heishman, vice president of economic development, business recruitment & territorial strategies. His team brought 100 projects across the finish line, with the Carolinas landing more than half of those (58, equal to the total number of expansions among the 100), and Indiana and Florida attracting 24 and 15, respectively. Utility economic development teams transform a region’s strengths into competitive advantage. Among the strategies deployed by the Duke team in 2017 was the assignment of each business recruitment manager to key cities where the majority of site consultants and related experts on service provider organizations reside: Atlanta, Detroit, Raleigh, Orlando and San Francisco. A total of 25 more sites (among 234 since 2005) were evaluated for the Duke Energy Site Readiness Program, whose portfolio over 12 years has welcomed 35 major projects resulting in the creation of 6,911 new jobs and approximately $7 billion in capital investment. Big wins included such companies as Egger Wood Products, Pfizer and Corning Fiber. But losses meant something too, says Heishman. "Duke Energy and its Economic Development Team shone brightest in what eventually turned out to be the loss of Toyota Mazda, Project New World," he writes of the project that landed in Huntsville instead of in North Carolina. "Led by the Economic Development team, the company mobilized across departments ranging from Transmission to Rates and Regulatory Affairs to make truly remarkable service commitments in a valiant attempt to win this project. In the end, Toyota chose to build its facility elsewhere. But the effort to win taught us indelible lessons about our resourcefulness and creativity, and it opened up new processes to accomplish what was once thought to be impossible — lessons that will no doubt serve us well in competitions to come." Entergy's economic developers helped bring 4,688 new jobs and more than $4.2 billion of investment to its four-state territory where it serves 2.9 million customers amidst a population of 6.5 million people. Major projects came from Wanhua Chemical Group in Louisiana, Butterball in Arkansas, Synnex in Mississippi and Jefferson Energy in Texas, among others. Louisiana led in both project value and job creation, followed by Texas. In 2017, Entergy Mississippi developed an Excellerator Grant program to help Mississippi communities be more competitive for industrial development, awarding $125,000 grants to 10 counties. Meanwhile, the utility's workforce training grant program continues to support programs such as the Southeast Texas Workforce Development Initiative and Operation Spark in New Orleans. 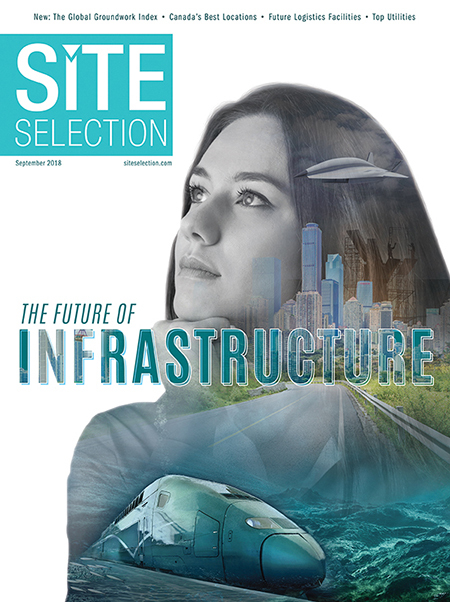 In addition to continuing its Strategic Site Initiative Project to add quality industrial sites across its territories, Entergy's renovated Site Selection Center website (buildingsandsites.com) launched in September 2017 with sophisticated property search options, filtering and data export options and a full range of ESRI data layers. While helping customers achieve sustainability goals, Entergy's been holding its own: In 2017 it was one of only five U.S. electric utilities to be named to the Dow Jones Sustainability North America Index, an honor Entergy has achieved for 16 years in a row. Arguably the flagship utility in Southern Company's stable (which includes strong performers Alabama Power and Mississippi Power), Georgia Power's efforts in 2017 led to attracting or retaining 15,792 jobs associated with $5.7 billion in corporate facility investment. Projects came from the likes of Alcon in the Atlanta suburb of Johns Creek, Interstate Paper in Riceboro, Luxottica in McDonough, Safavieh in Savannah and Pratt-Whitney Forging in Columbus. Capital investment results were nearly double the team's 2017 goal, and the largest total in Georgia Power's economic development history. Among the Community and Economic Development team's accomplishments in 2017 was the transformation of its physical plant into the Georgia Experience Center (GEC), which includes The Immersion Room (an interactive presentation experience); The Barometer of Boom (a digital art installation based on data visualization); and the Hometown Hall of Fame, a space dedicated to featuring accomplishments of cities around the state. The redesign of SelectGeorgia.com offered communities, prospects and partners a more dynamic way to engage with the team and content. To support the state's booming film and TV production scene, the Georgia Power team also has launched an online database highlighting Georgia Power–owned properties, (including lakes, land, and buildings) that can be used for film or TV locations. In 2017 there were 155 projects announced within LG&E and KU Energy's service territory, creating 7,471 jobs for the Commonwealth of Kentucky with an associated capital investment of more than $4 billion. In 2017 LG&E and KU Energy provided over $1.2 million in economic development rider credits to participants. The company also has continued a long-term investment strategy of zero-interest loans to support the development of industrial land in two Kentucky communities that totals an investment of over $500,000. The company is in the process of investing $2.2 billion in its electric and natural gas network by installing intelligent control equipment on its distribution system to enhance system restoration and improve service. It's also established a commercial-scale battery and energy storage research project in collaboration with the Electric Power Research Institute. In announcing its 2017 numbers in May, the utility noted that, in addition to serving on economic development boards and associations, LG&E and KU is a founding sponsor of KentuckyUnited (KYU), established in 2008 to market the state to site selection consultants and business attraction leaders nationally and internationally through site visits and events. Performing well on per-capita measures for its 13-county population of 833,000, the Omaha Public Power District service area was involved in 40 projects creating 861 new jobs and retaining 520 jobs in 2017. The top projects by job creation were: Facebook (100+ jobs, $1 billion); Evolva (50 jobs, $60 million); Veramaris (20 jobs, $200 million); LightEdge (10 jobs, $15 million); and Novozymes (10 jobs, $15 million). As a public power utility OPPD takes its role in economic development seriously, says Tim O'Brien, manager, economic development, noting that state statute requires public power entities to engage in economic development. Full engagement by OPPD was part of the banner year that saw Nebraska capture Site Selection's per-capita Governor's Cup trophy, and Greater Omaha rank No. 1 among metro areas with populations between 200,000 and 1 million in Site Selection's ranking of Top Metros. The utility is busy with a site development program and new marketing platform. Its commitment underlying it all is to provide rates 20 percent below the national average. (Now that's a good start to a new slogan.) With the addition of a new wind facility, OPPD aims to provide approximately 40 percent of its generation from renewable energy sources when the facility comes online, currently scheduled for late 2019. Meanwhile, it's working toward another wind project of 250 to 300 megawatts that would put the utility at more than 50 percent of retail sales coming from renewables. PECO was part of a Greater Philadelphia regional effort that saw more than 110 projects land in its territory, including major investments from Aramark, Cerner, Comcast, GSK and Spark Therapeutics. Maureen Sharkey, economic development specialist for PECO's Economic & Business Development Department, says "Unlike years ago, when PECO led the effort to showcase Greater Philadelphia's assets nationwide and abroad, the impact of deregulation, realities of energy efficiency requirements, the need for advanced energy solutions, and market trends that favor urban areas like Greater Philadelphia led to a conscientious shift. Rather than being directly involved with regional marketing, we rely on our key partners for business attraction, support their efforts on an as-needed basis, and celebrate their success." A case in point: In Montgomery County, drug distributor Amerisource Bergen announced its plans for a new headquarters, consolidating work space for 1,500 and creating 550 new information technology jobs. "PECO Economic Development provided utility information services for two developers vying for that deal and will continue to support the winner, Keystone Property Group, as the project moves into construction phase later this year," she says. Involvement in major public-private projects is a PECO trademark, including building two 13-kilovolt circuits to meet the demands of five new super post-Panamax electric cranes at the newly expanded Port of Philadelphia, where the Commonwealth invested $300 million. PECO also supports uCity Square, the mixed-use community in Philadelphia's University City; and the $3.5 billion, 6.9-million-sq.-ft. (641,010-sq.-m.) Schuylkill Yards project from Brandywine Realty Trust. "PECO Economic Development meets with Brandywine on a regular basis, discussing advanced energy solutions for the first phase of the project, which includes the construction of two towers — or more, if locating within the University of Pennsylvania and Drexel University footprint works for Amazon," Sharkey says. The South Carolina Power Team (SCPT) service area covers all 46 counties in South Carolina, where team members helped to welcome 5,410 new jobs via $1.57 billion in corporate facility investments. "Our team played a substantial role in landing the Samsung Electronics deal of $380 million in Newberry County," says James Chavez, South Carolina Power Team's president and CEO, of the 950-job project. "The July 2017 announcement utilized SCPT Incentive Funds." In 2014, the boards of both SC Power Team and Santee Cooper approved the establishment of a $30 million Site Readiness Fund (SRF), which matches local funds to advance sites and buildings across South Carolina to make them market-ready. "In 2017, the board of SC Power Team and Central Electric Power Cooperative, Inc. voted to increase the fund by nearly $6 million, increasing the fund to nearly $36 million," says Chavez. "More than $130 million in combined funds have been put into making sites market-ready throughout South Carolina, meaning the SRF commitments of more than $27 million have leveraged an additional $100+ million in investment from local governments and electric cooperatives." Projects influenced by SRF improvements have included GE Renewables in Laurens County; Volvo's $520-million investment in Edisto Electric Co-op territory and the SC Ports Authority's inland port in Dillon. Among the unique tools the team brings to the table is Project Pioneer, a statewide comprehensive labor study for South Carolina that was conducted by Texas-based Site Selection Group. It was commissioned by the SC Power Team and funded by South Carolina's electric cooperatives. SCPowerTeam.com has a new area on the site dedicated to the labor study and its findings. "The SC Power Team's state-of-the-art Geographic Information System (GIS) web applications will offer custom reporting capabilities and access to raw data," said the team, "utilizing ArcGIS integration." Project wins including Nokian Tyre in Dayton, Tennessee, and the big Toyota/Mazda JV in Huntsville, Alabama, were among totals exceeding 70,000 new jobs and $8.3 billion in corporate investment. The success continues in 2018. In May at a board meeting, TVA said its economic development partnerships had attracted or retained 42,000 jobs and secured $8.5 billion in capital investment in the Valley over the previous six months alone. The board also authorized a three-year pilot program to establish an optional electric vehicle charging rate. The range of economic development activity across TVA is as broad as its territory, from a new solar farm to new transmission and switching stations near the Infinity Megasite in Mississippi. In 2017, TVA added aerospace and defense to its target industries, helped put together a new Composites Coalition, and continued to improve the three initiatives that comprise Product Development: the TVA Megasites Program, the InvestPrep™ Program and New Legacy Sites. TVA in its most recent fiscal year provided nearly $524 million in tax equivalent payments in the eight states where it sells electricity or owns assets, and directly to 146 local governments where it owns power facilities. "These funds represent another way TVA works with state and local government to invest in continued economic development, improved quality of life and overall community growth to benefit those we serve," said Bill Johnson, TVA president and CEO. The scale of TVA’s utility infrastructure is rivaled by its perennial high performance when it comes to economic development.